'Do you remember the first time you saw a dinosaur?' Claire asks in the opening moments of a new Jurassic World: Fallen Kingdom extended featurette that takes fans behind-the-scenes of the latest Jurassic Park franchise sequel. 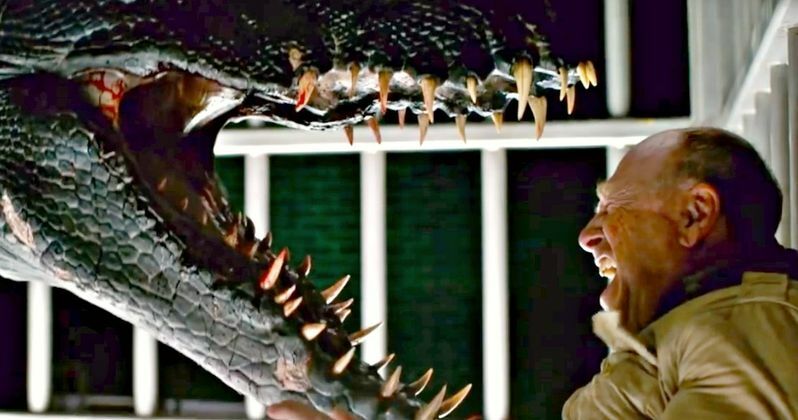 In it, we get to see the animatronic dinosaurs come to vivid life, how their skin is grafted onto their metal bones, and how their realistic looking teeth are covered in practical ooze. It's a wonderful introduction to this next chapter in the dino saga. This almost three minute expose gives everyone a good look at the new dinosaurs on display in the movie, along with never-before-seen shots from the movie from the perspective of the crew. There are interviews with Chris Pratt, Bryce Dallas Howard and newcomer Justice Smith, who are clearly seen having a lot of fun traversing this 'Jurassic' world on practical sets. Says Pratt about the experience. "The Jurassic movies have always been suspenseful and exciting. We're telling the next chapter. We're literally blowing up the island. Be careful. There are dinosaurs everywhere. They are flipping out and killing people. It's like nothing you've ever seen before. It's going to be Jurassic." Some of the footage explores the military's involvement in the story. We get to see vehicles and helicopters decent onto Isla Nublar as Owen and Claire prepare to save their precious dinosaurs from an impending volcanic eruption. We get to see some of the chases, explosions, and on-set chemistry behind the characters. We also get to see some of the dead dinosaur carcasses littered across the tropical island landscape. Bryce Dallas Howard says this. "This story takes dinosaurs, and takes Jurassic, where it's never gone before." The producers and director Juan Antonio Bayona are also on hand to discuss the making of Jurassic World 2, taking fans deep into the production process, giving unprecedented access to what transpired during the movie shoot. There are some tense scenes on display, we see dinosaurs eating security guards, some sneaking around, and we even get to see the new dinosaur Baryonyx in full glory. Nope, that's definitely not a T-Rex. The featurette also runs down the new and returning characters, offering a first look at them. These include Jeff Goldblum as Dr. Ian Malcolm. We also get to see a lot of the new animatronic dinosaurs in detail. Producer Colin Trevorrow, who directed the first movie, ends the featurette by saying this. "This movie is different. It's going to be intense and spectacular." There is a lot of footage here to digest. And it's an interesting move releasing this featurette before the first Jurassic World 2 trailer arrives. We have to imagine that a lot of what is on display here will make it into the movie. You can check it all out, thanks to Universal Pictures.